My love of Greek food goes back to when my husband and I lived in Chicago, more than 20 years ago. We were poor students, and we couldn’t afford tickets to pro sports or high end theatre, but we could afford to take the train from Hyde Park into Greektown for a Greek-American meal served up with theatrical flair. If you’ve never been to Chicago’s Greektown, I recommend going there. It’s a lot of fun, with rows of restaurants decked out in white columns, grape leaves, and all things Greek. If you go to Greektown, be sure to try the flaming saganaki, a fiery cheese appetizer invented in Chicago that you won’t actually find in Greece. Another thing you’ll find at almost every table is authentic Greek tzatziki sauce, a traditional white sauce made with yogurt, cucumbers, olive oil, fresh herbs and garlic. It’s served with grilled or roasted meats, or as a dip with crackers or pita wedges. I got this recipe for authentic Greek tzatziki sauce from a vacation I took to Greece last year, so I really can claim it’s authentic. My husband, 18-year-old daughter and I took a Greek cooking class, and it was one of the highlights of our trip! Like many traditional cuisines, Greek cuisine relies on a few core ingredients that are combined and recombined in endless ways. This recipe combines Greek yogurt, cucumber, olive oil, fresh herbs and garlic for a sauce that’s tangy, fresh and totally addictive! While the cucumber is draining, you can mix up the rest of the ingredients: Greek yogurt, olive oil, red wine vinegar, garlic, fresh pepper, and chopped fresh mint. Use extra virgin olive oil, preferably from Greece. I only buy Greek olive oil if it’s on sale, because it’s expensive where I live. For the yogurt, I like Fage brand, which is a favorite in Greece. My Greek cooking teacher insisted that you must use full fat yogurt, but I think low fat or nonfat is okay, because the sauce has a lot of olive oil in it. 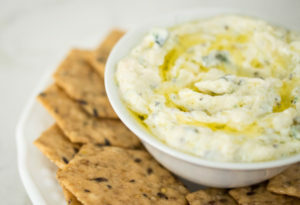 Greek cooks debate whether mint or dill is better for tzatziki sauce. Mint is considered cooling, while dill is considered sharp and zesty. I’ve tried both, and I don’t think there’s a huge difference, but I prefer mint. Use whichever one you like. If you don’t have fresh herbs, dried herbs work out okay, but use 1/4 to 1/3 the amount. Once you’ve combined all the other ingredients, add the well-drained cucumber to the sauce. Once everything is mixed together, taste the sauce and add more salt, pepper, vinegar, garlic or herbs according to your taste. 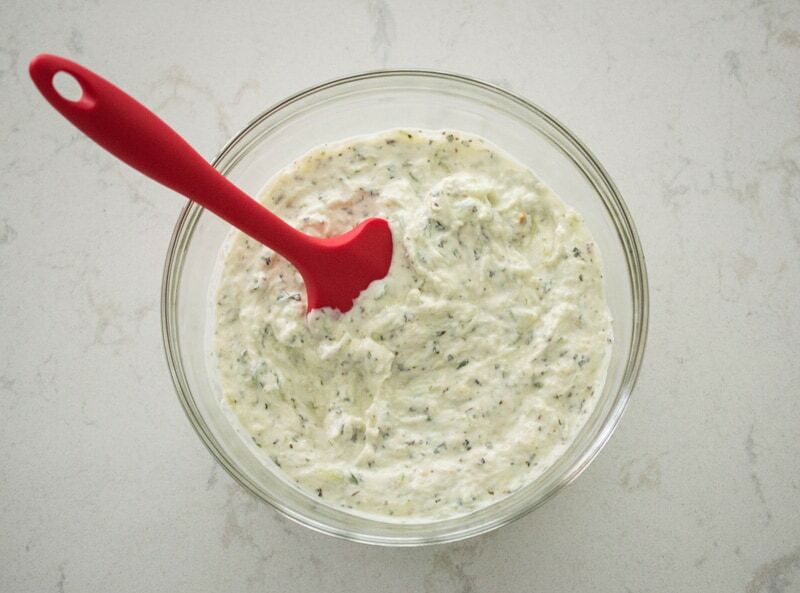 If possible, let the tzatziki sauce rest in the fridge for an hour or more so the flavors can blend. That’s it! 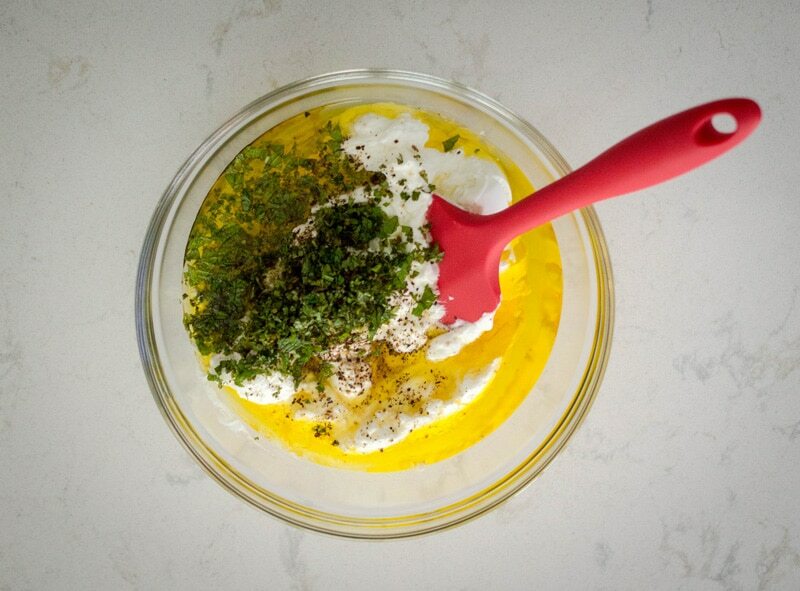 Making authentic Greek tzatziki sauce is super easy and absolutely worth the time it takes. Lately I’ve been making a batch of it just about every week, and eating it with gluten free crackers for a light lunch or snack. I’ve also been serving it with grilled meat like these Greek grilled pork chops. It’s one of my favorite, and the world’s favorite, ways to eat Greek yogurt. Authentic Greek Tzatziki sauce is tangy, fresh, and positively addictive! 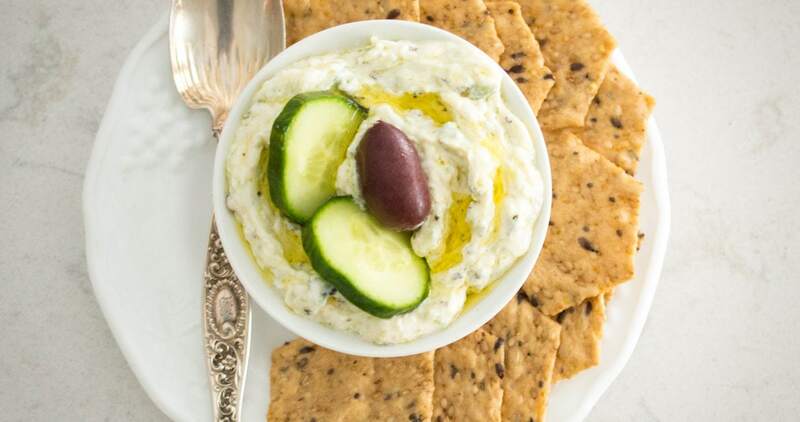 Serve with chicken, pork or lamb, or as a dip with crackers or pita wedges. Wash the cucumber and cut off the ends. Grate using a food processor or box grater. 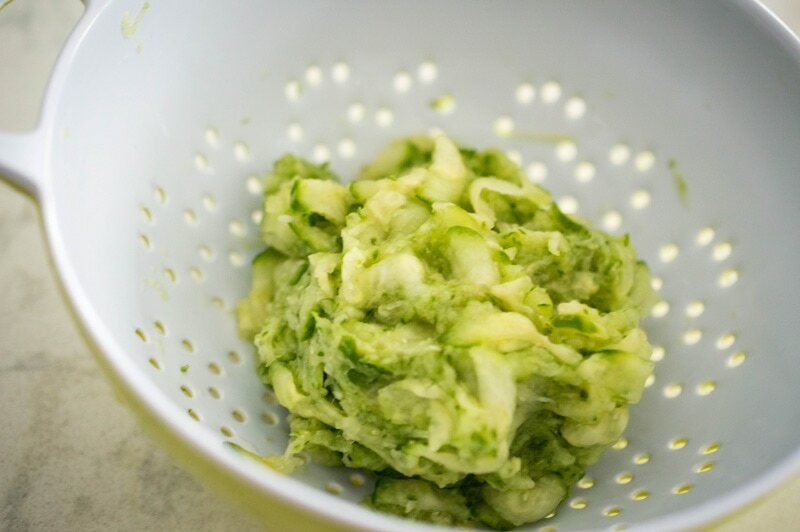 Place the grated cucumber in a colander and sprinkle with salt, mixing so all the cucumber pieces are coated. Place the colander over a bowl so the salt can draw the moisture out of the cucumber. Allow the cucumber to drain for 15-30 minutes. Combine the other ingredients in a medium mixing bowl. Press and squeeze the cucumber with your hands until you have pressed out as much water as possible. Stir the cucumber into the yogurt mixture. Taste and add more salt, pepper, vinegar, garlic or herbs if you like. Tzatziki tastes best if allowed to chill in the refrigerator for at least an hour. 5g fat, 1g carbohydrate, 2g protein per serving. Nutrition information based on using nonfat Greek yogurt.